Installation View of Wang Guangle’s ‘Duo Color’ at Pace Gallery. Wang Guangle, 180715, 2018. Courtesy of Pace Gallery. Wang Guangle, 180723, 2018. Courtesy of Pace Gallery. Much has been made about “Chinese abstraction”, a phrase that implies an aesthetic that diverges from western formalism. Perhaps a case can be made when examining new ink painting with its many practitioners forging a link between a kind of abstract expressionism and the tradition of calligraphy. But, it becomes more challenging to make a case for a uniquely Chinese brand of abstract painting when considering the recent efforts of younger oil painters, such as Wang Guangle, Qu Xu, and Li Shurui, whose optics overlap with concerns that American and European painters have had for some time. Still, when regarding the work of Wang Guangle in particular, it becomes clear that a strictly western interpretation leaves out much of what is most interesting about these mesmerizing paintings. 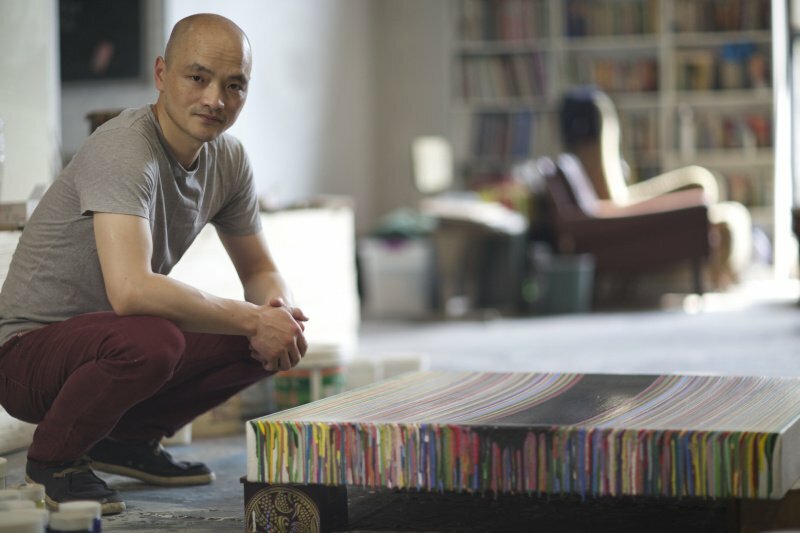 Wang Guangle paints every day in a meditative practice that imbues each of his canvases with the sensation of the passage of time. Working from the edge of the surface to the center, he gradually shifts shades of color until the resulting image appears as a dark void at the end of a hallway, creating a convincing illusion of depth. Entering one of his exhibitions is like stepping into a panopticon, a room offering 360 degree views of surrounding cells and passageways. Only when you approach a single painting and examine it closely, can you see the laborious effort that went into its creation with hundreds upon hundreds of carefully placed brushstrokes arranged horizontally and vertically to create the central image of a rectangle. 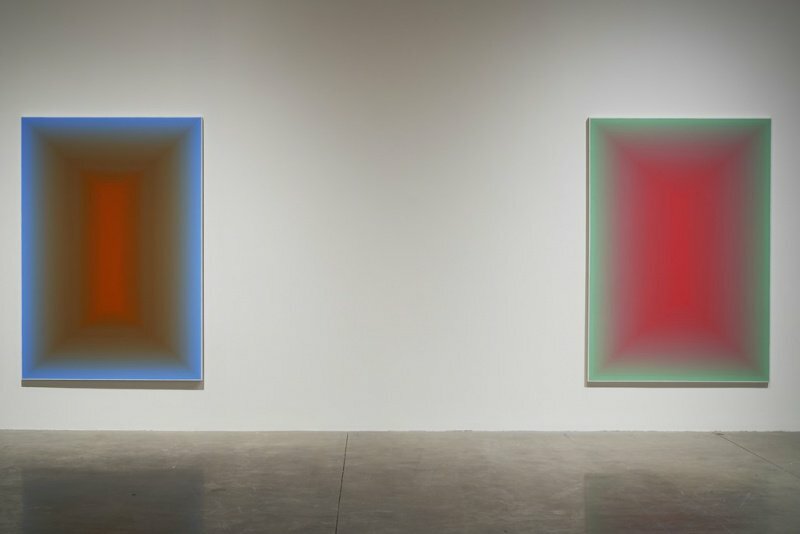 While Wang Guangle has often worked monochromatically, in this most recent exhibition, he employed two opposing colors for each work. Starting with a can of paint in one color, he begins his process at the farthest most edges of the canvas. 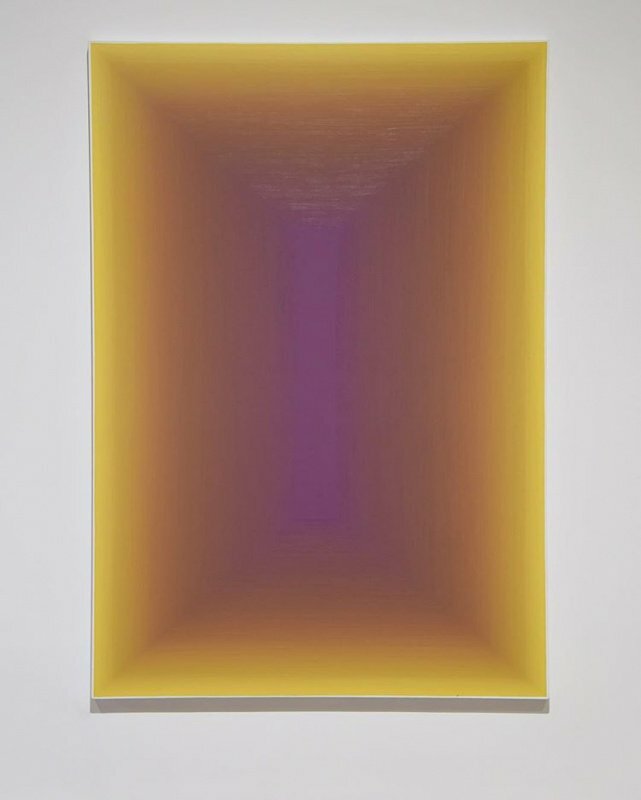 He gradually adds the second hue to the first as he works his way to the center, creating a gradation as subtle as a James Turrell installation at sunset. The illusion of light is palpable, all the more magical at close range when one can see that this incandescent composition is only the result of ordinary acrylic paint. 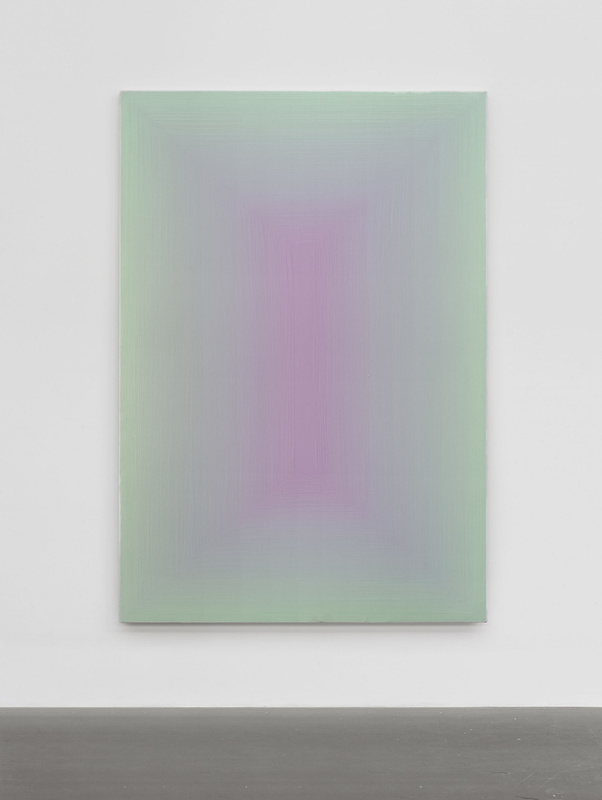 Often compared to Mark Rothko, Wang Guangle equally makes works that convey a mystical aura with forms that radiate light without the assistance of electric bulbs. In this exhibition, the artist often paired two paintings, using the same two hues but reversing the order. For example, in 180715 (2018)- the painting’s title refers to the date the work was finished–a misty lavender gradually gives way to a central rectangle of golden ochre, while 181004, 2018, begins with a golden edge that works it way to a dark purple center. This doubling effect is most powerful in the pair of 181127 and 120716 in which bright pink meets a deep turquoise creating the optical illusion of forms popping off the background. The same color combination is also present in 180723, the most ephemeral work in the exhibition with its rosy center seemingly evaporating into the pale teal background.